At long last, the "Wizard" of the guitar reveals, in person, the mysteries of playing the guitar. 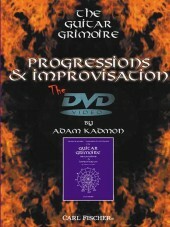 This series offers guitar students the opportunity to see and hear Adam Kadmon reveal and demonstrate the techniques and understanding of the underlying structure of music that have helped make the books of The Guitar Grimoire among the best-selling guitar pedagogy publications of all time. 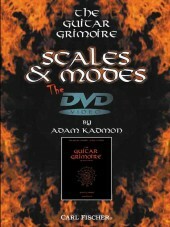 This DVD leaves no stone unturned in teaching you how to understand Scales and Modes right of the The Guitar Grimoire: Scales and Modes . Lessons on: The Major Scale, Intervals, Scales, Modes, Transposing, Applying it to the Guitar, Patterns and Pattern Connection. This DVD picks up where Scales & Modes leaves off, teaching everything about scale compatiblity, chords, voicings, arpeggios and substitutions. 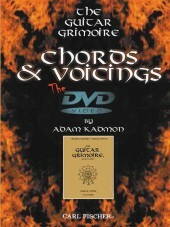 Matches the book The Guitar Grimoire: Chords and Voicings . Lessons on: Chords and Compatibility, Chord Naming, Voicing Chords, Harmony Leads, Moveable Chords, Arpeggios, Inversions, Polychords and Slashchords and Substitutions. This DVD explains what progressions are and teaches you how to use your scales, modes and chords over them in compositions and jams. Matches the book The Guitar Grimoire: Progressions and Improvisation . Lessons on: Scale Tone Degrees, Circle of Fifths, Circle Progressions, Scale Tone Degree Alterations, Instant Song Creator, Improvising of 12-Bar Progressions, Soloing Within A Window, Soloing Over Diatonic and Circle Progressions and Soloing Over Scale Tone Degree Progressions.